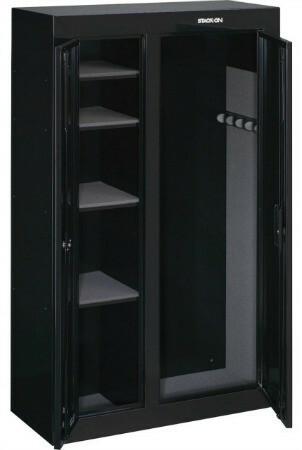 This 10 Gun double door Security Cabinet with convertible interior comes with two separately keyed locks; allowing for storage of guns separate from ammunition or for varied levels of access for family members. Molded barrel rests with included scoped rifle standoffs will hold long guns in place for a lifetime. The 3-point locking system and welded steel construction keep firearms and valuables safe and secure.